The contest, which honors the best in local neighborhoods, runs from June 5 to July 6. The grand prize: a VIP all-inclusive weekend to the awards show. 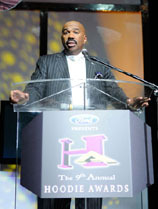 The “Steve Harvey Morning Show” and Ford Motor Company have teamed up to bring you a new life experience in Las Vegas with the “Escape to the 2012 Ford Hoodie Awards” video contest, which kicks off June 5. Hosted for the 10th year by the top-rated radio host, best-selling author of the book (and the film version of) “Think Like A Man” — and the host of TV’s “Family Feud” — Steve Harvey’s highly anticipated awards show honoring the nation’s best community leaders, educators, neighborhood churches and local businesses will be a blowout celebration, with the chance for lucky listeners to experience Las Vegas’ glittering entertainment and majestic attractions in this new contest. A once-in-a-lifetime grand prize adventure for a listener and three guests, the Escape to the 2012 Ford Hoodie Awards takes the winner and guests to Las Vegas for a VIP all-inclusive weekend Aug. 3−6 at the Ford Hoodie Awards. Featured are luxurious pampering, entertainment, a Grand Canyon helicopter ride and traveling around the city in an all-new 2013 Ford Escape. To enter the Escape awards video contest, from June 5 to June 27 listeners can log on to www.SteveHarvey.com to submit their video on “Why they need to escape to the 2012 Ford Hoodie Awards,” check out the new Ford Escape and more. The “Steve Harvey Morning Show” and Ford Motor Company will judge all entries and post the top three videos on www.SteveHarvey.com, starting July 2, where listeners can vote for their favorite video through July 5. The video receiving the most votes will win the grand prize, and one lucky voter will receive a prize package for two to the 2012 Ford Hoodie Awards. Created in 2001 by Steve Harvey and television/radio producer Rushion McDonald to give star treatment to everyday men and women who uplift their neighborhoods, this year’s 10th anniversary Ford Hoodie Awards show will be bigger than ever. The show has become the crowning honor for urban communities. Voting for the 12 awards show categories will also kick off on “The Steve Harvey Morning Show” from June 4 to June 19, with voting open on www.SteveHarvey.com in one category per day. Listen to “The Steve Harvey Morning Show” weekdays on your radio or online live 6 – 10 a.m. EST for updates, laughs, daily inspiration and more. And log onto www.SteveHarvey.com. It’s the central place to submit videos for the contest, to vote and to see a rundown of contest rules, award nominees, tickets, packages for the 2012 Ford Hoodie Awards. The “Escape to the 2012 Ford Hoodie Awards” grand prize winner and voting prize winner will be unveiled on “The Steve Harvey Morning Show” on July 6. • 2 tickets to the 10th Annual Ford Hoodie Awards Show on Aug. 4, hosted by Steve Harvey.